Having been invited to popup bar ‘Aperol Spritz Social’ in Spinningfields last night where I was contractually obligated to drink many complimentary cocktails I was feeling somewhat delicate this morning. I remembered being impressed by the breakfast menu on my last trip to Delicieux so decided to check it out and see if they can fix poorly heads. 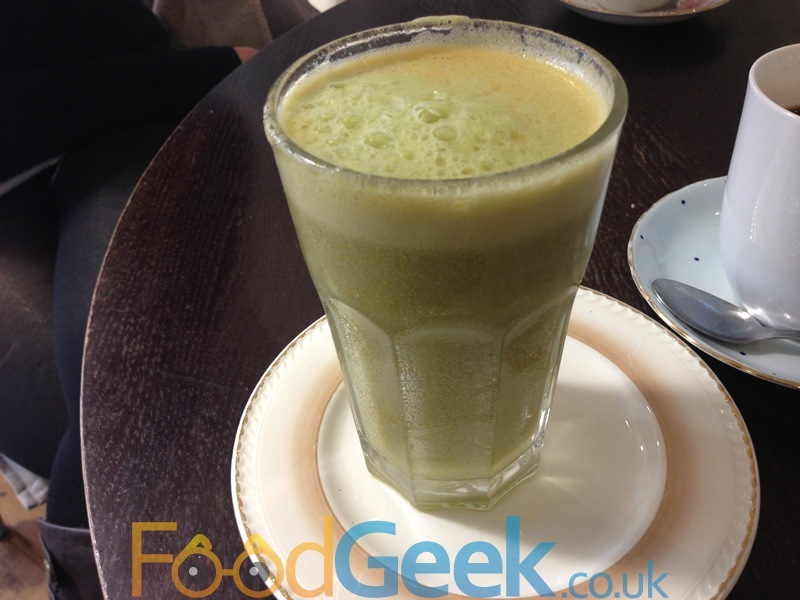 Starting with a glass of ‘Super Juice’. It’s freshly squeezed using a combination of fruit & vegetables depending what’s available on the day. I could pick out carrot and apple flavour but had to check the rest and was surprised to hear it contained amongst other ingredients: courgette, pea shoots & peppers! It’s a bit pricy at £3.50 a glass but very tasty and I could feel myself getting healthier with every sip. 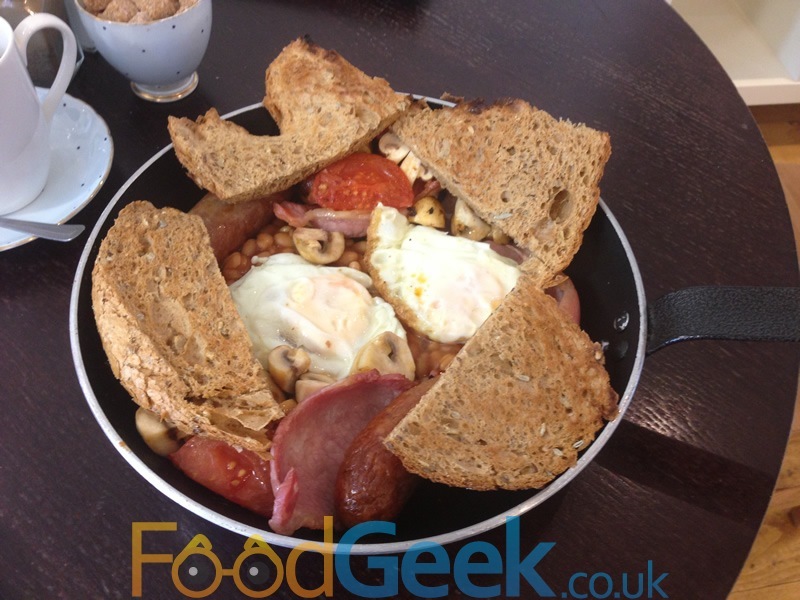 Next we shared the cooked breakfast platter. Sadly the haggis hadn’t arrived yet so we had to console ourselves with extra bacon. The thick cut & high quality bacon wasn’t a bad substitue for haggis, though it would have been even better had it been smoked. Bacon that isn’t smoked is a little bit pointless if you ask me. Served in a frying pan the platter also contained the usual sausage, eggs, mushrooms, beans, tomatoes & toast. All good quality, particularly the freshly baked bread and the thick and meaty sausage which was excellent. The best bit was the bottom of the pan in which all of the various juices had combined to make a delicious meaty, tomatoey liquid which was lovely to mop up with the toast. Feeling about 70% better after juice and bacon but rather full we contemplated leaving it at that. Something else on the menu had caught our eye though. ‘Dipping Croissant’ is a warm buttery croissant served with a smooth, thick and very rich hot chocolate sauce. I’m glad we got it as it’s pure indulgence and comfort. I love croissants but fear i’ll never be able to eat them again without a pot of this amazing hot chocolate to dunk it in. Along with a couple of very good black coffees the breakfast certainly did it’s job as I left feeling a million times better than when I arrived. It was also the best quality and most enjoyable breakfast i’ve eaten for a long time too. Just like our previous visit the staff were all very friendly and even more efficient this time, we were in and out in under 40 minutes! 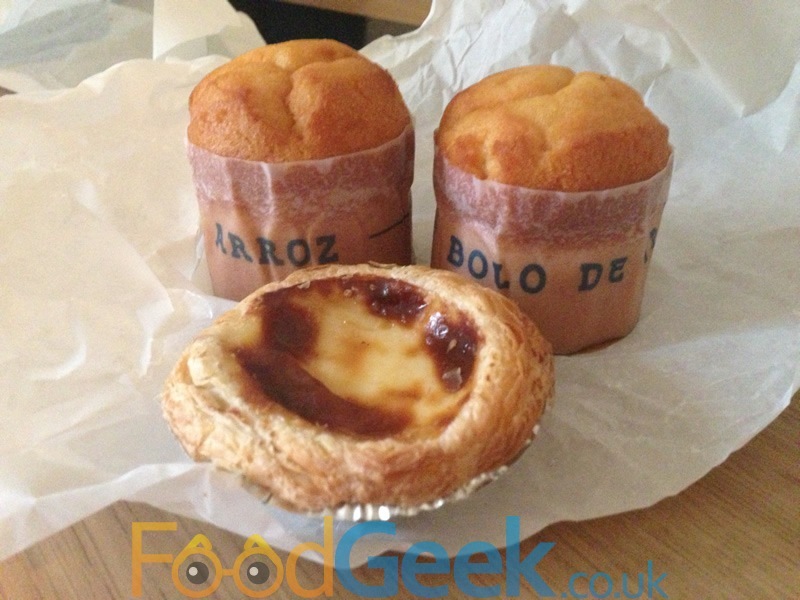 As we were leaving I couldn’t resist buying a few cakes as well, I nabbed a couple of my favourite Portugese Nata (egg tarts) and light as a feather Portugese sponge cakes ‘Bolo De Arroz’. Both of which were thoroughly enjoyed later. 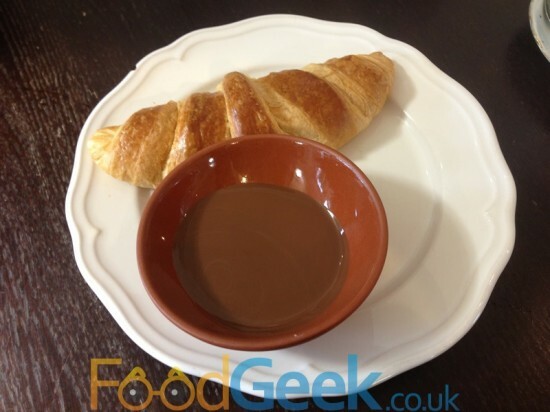 Previous: The Farmers Arms Reopens And Finally Brings Decent Food To Bolton! Next: Teppanyaki Manchester, Surely It Can’t Be As Bad As Sapporo?